My sincere thanks to everyone who buys a book or pattern, a notion or some of my fabrics through the year as it allows me to continue doing what I love. Where would I be without you? So....I'm having a Customer Appreciation SALE! Visit my website and shop all of my fabric on the bolt for 20% off every print in stock! Saturday, December and Sunday, December 30th only!!! Stock up and save while supplies last. Happy Shopping and thank you all so much! I received a wonderful gift the other day from my friends Debbie and Ronda. Debbie made me a new Deck The Halls quilt and Ronda quilted it for me. It was their Christmas gift to me. There are so many good people in this world, and while bad things sometimes happen to all of us, many more good things happen than bad. Especially during this Christmas celebration, it's important to remember Good Will Toward Men and Women! Thank you Debbie and Ronda for your very special gift! 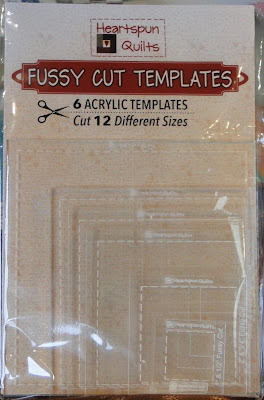 My thanks to everyone who took the time to comment on my new Fussy Cut templates! I can't tell you how many times in the past 20 yrs. 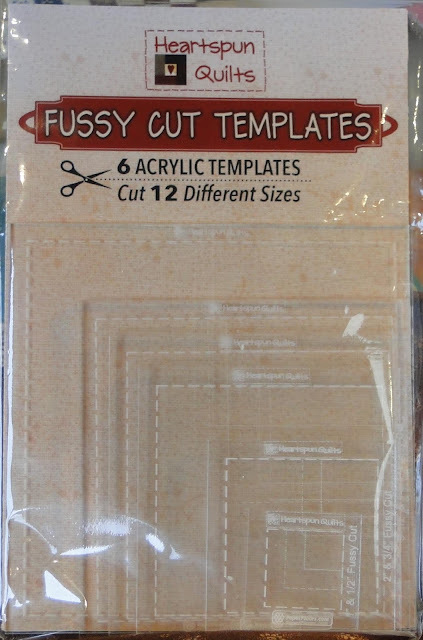 I have needed these fussy cut templates! I love to center a special motif or saying on some of my quilt blocks. Happy Holidays and thanks so much for the very special drawing!!! Congratulations, Nettie! 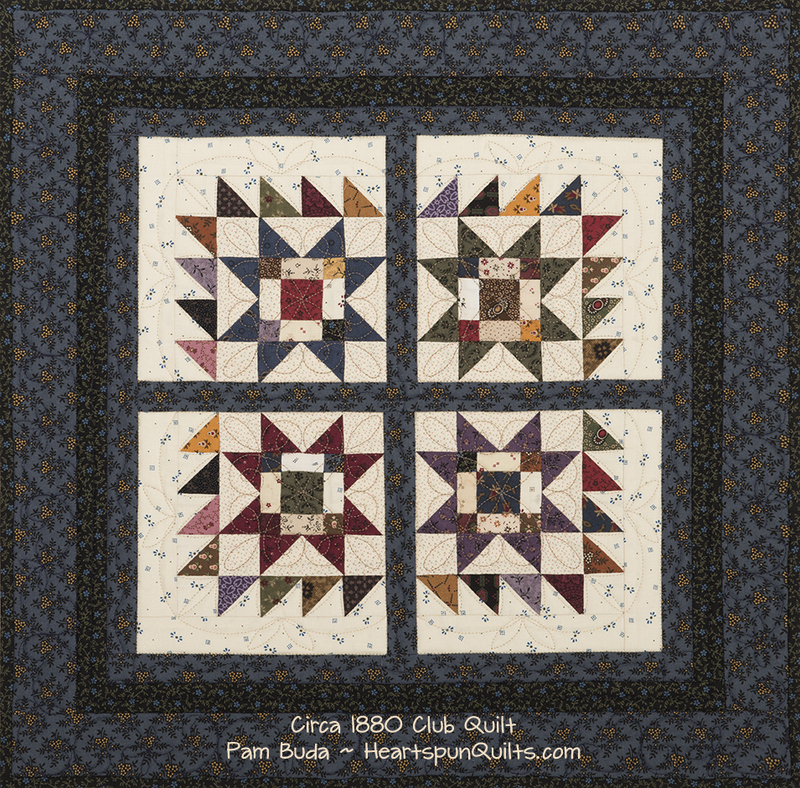 Please email your mailing address to Pam@HeartspunQuilts.com. Many thanks to everyone who took the time to comment. I read them all and enjoyed them. Click here to order a set for your Christmas stocking or for Santa to give to you....wink, wink! Besides preparing for Christmas, and the usual work of filling orders and such, I'm working on several new quilt designs. 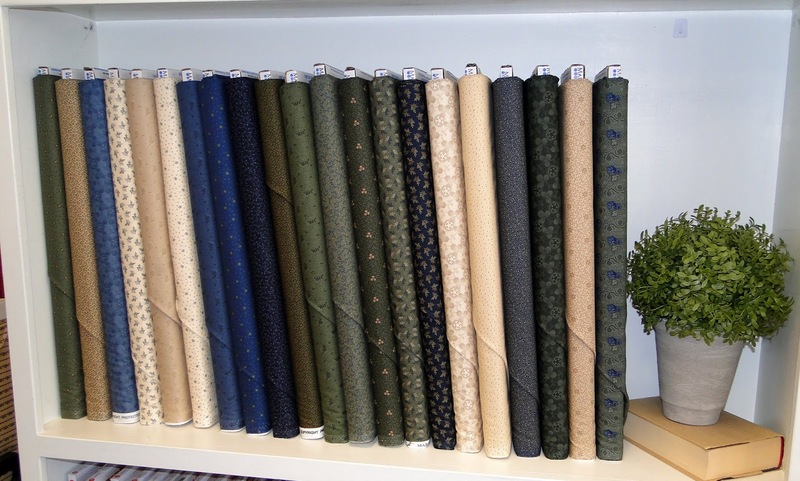 There are two new fabric lines in the works and several more planned for next year. It definitely keeps me out of trouble!! While we are all so busy at this time of year, I try to find a little "me" time each day to sew something for myself as it makes me a much happier person. You, too? While I was working on The Circa 1880 Nine Patch quilt, I cut lots and lots of fussy cut motifs for the blocks. I love the surprises fussy cutting gives, especially in such a scrappy quilt! This is what I was using to fussy cut my motifs. Yeah....it works, but not well. I didn't always get the motifs centered correctly because the ruler lines make it difficult to see. Over and over again, I wished I had a clear template showing an unobstructed view of the fabric I wanted to cut. As they say.....necessity is the mother of invention! I designed what I think are the perfect fussy cut templates! Each template will cut two sizes of motifs. 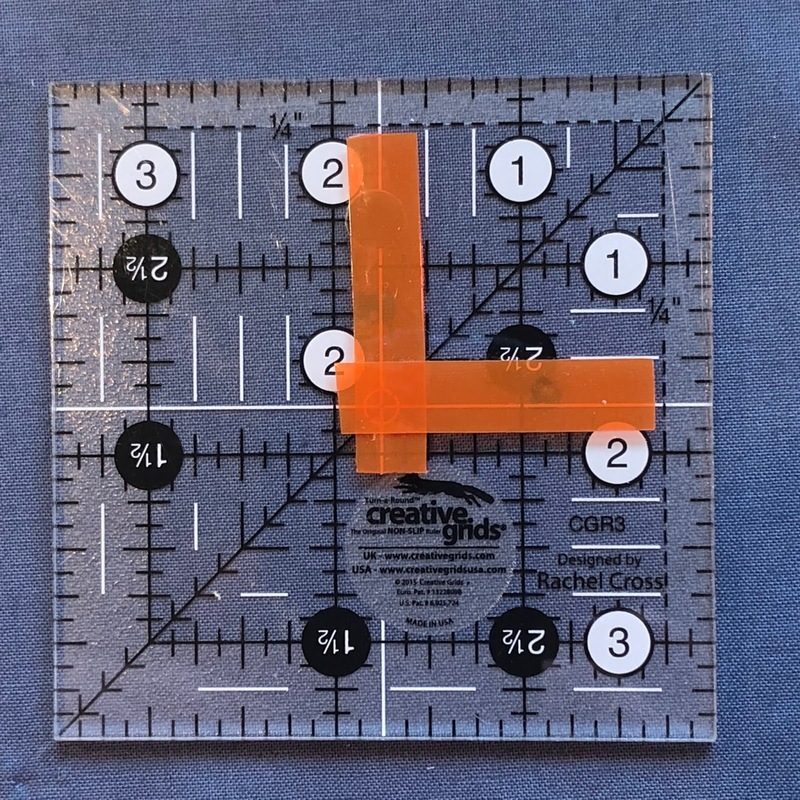 In the sample above, the full template size cuts a 3 1/2 inch finished square. 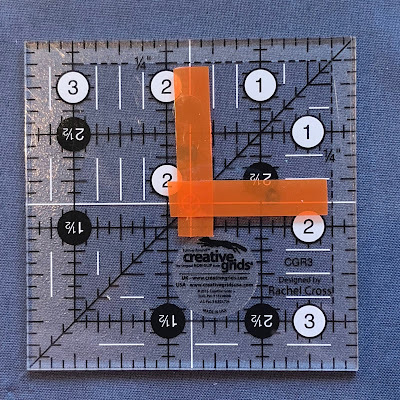 The inset square cuts a 1 3/4 inch finished square. I deliberately made the inset lines very faint so as not to obscure the view of the larger motif. I love it!! For the smaller size, center the design in the inset square (white arrows.) Make the first two cuts on the right and top of the template. Instructions, with color photos, is included in the set. To celebrate the debut of my new Fussy Cut Template set, I'm giving away a set to one lucky winner! Leave a comment on my blog by midnight, Friday, December 7th and I'll randomly choose a winner. Please include your email so I can notify you. To be fair to everyone, do not email your comment. Only blog comments are eligible. If you can't wait....or need a Christmas gift for yourself (your hubby will appreciate the hint!) 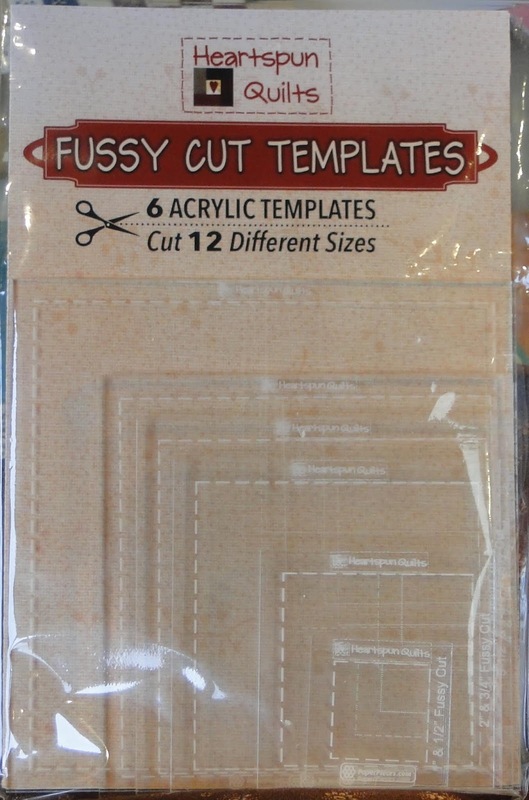 or a special quilting friend, the Fussy Cut Templates are in stock and ready to ship today!! I hope you're enjoying the holiday season so far. Our home decorating is nearly complete. I started to do some shopping but stopped because we've been busy preparing to ship Mrs. Miller's Apprentice patterns to quilt shops as the BOM begins in January. I still can't believe it's DECEMBER!!! Stay cozy under a quilt...or two....or three! In the evenings, I truly enjoy hand stitching while I watch TV. I rotate between projects depending on my mood. Sometimes I work on a hexie quilt, sometimes hand piece blocks, stitch binding, or hand quilt. 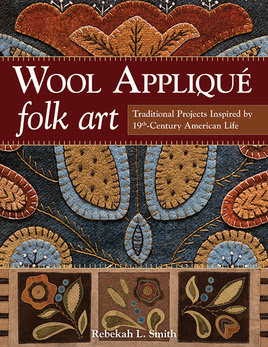 I do love working with wool applique and one of my favorite artists is Rebekah L. Smith. I truly adore Rebekah's folk art style and her whimsical designs never disappoint! Rebekah has a copy of my Vintage Patchwork book to giveaway. 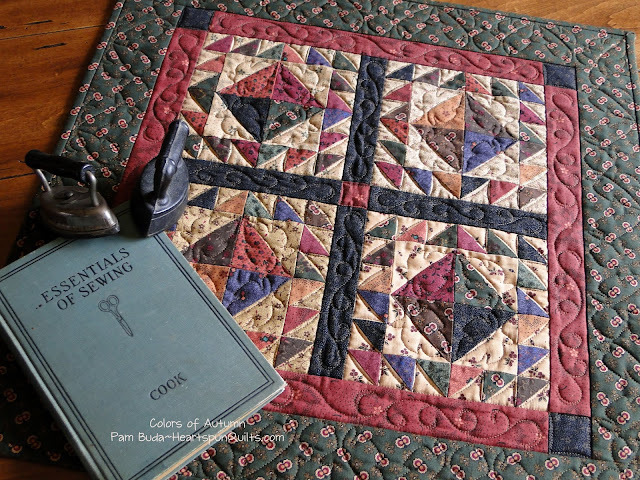 If you'd like a chance to win a copy of my Vintage Patchwork book, head over to her blog and be sure to take some time to browse her website, too. I promise you'll be inspired and tempted to shop! I had to buy the pattern and kit for her newly released design called Autumn Fowl. Love, love!! Thanks, Rebekah, for sharing my work with your readers! I have a very full and thankful heart on this Thanksgiving Day. My family is together and we have our health. I thank you, my fellow quilters, for your support of my little company....my quilt patterns, and fabric, for without you, I would not be able to continue the work that I love. I feel very blessed. 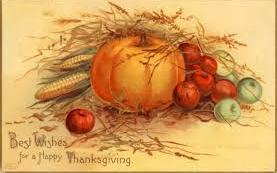 I wish you all a very Happy Thanksgiving!! I'm over the moon happy to report that quilt shops all over are signing up for my Circa 1880 Club every day. I believe a shop in Canada is signing up so our friends to the North will be included in the fun. 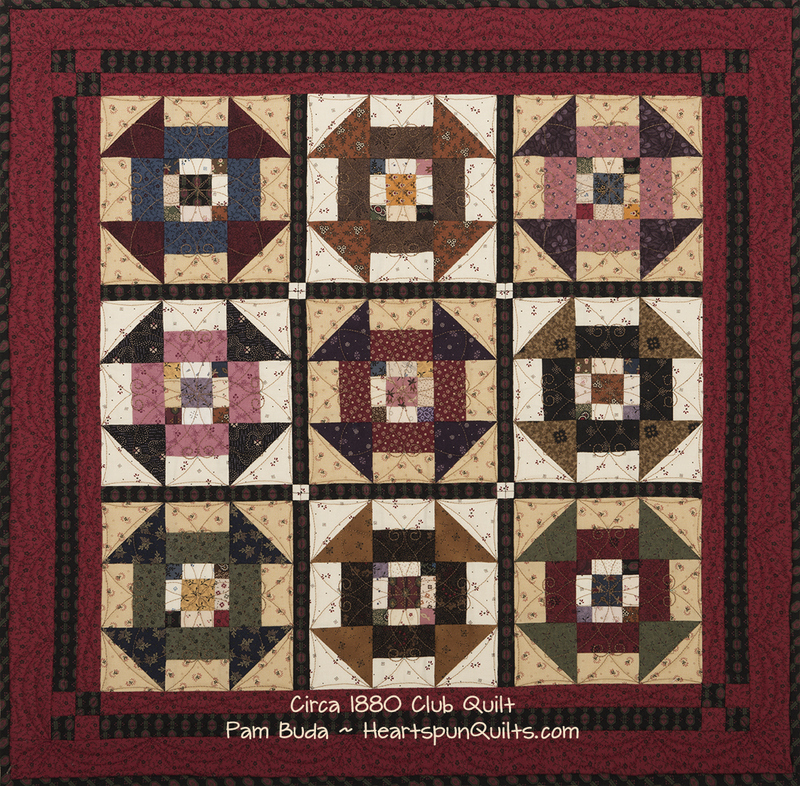 One of the benefits of being a club member is getting the pattern for the six exclusive small club quilts. You will notice that in each of the club quilts, I used the same Uneven Nine Patch block I used in the big quilt. Sometimes they're paired with other fun blocks. Sometimes just that cute little block! 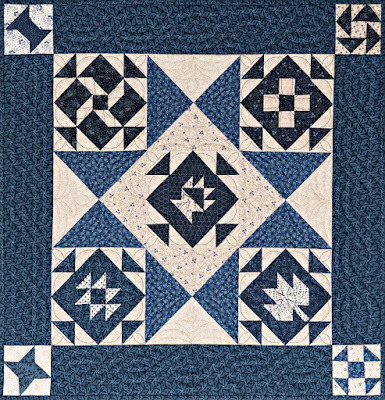 Each quilt also features the brand new Circa Basic Essentials fabrics and is given at just the right time of year. The pattern/kit for the quilt above is given in December. There are other benefits of the club, too! But...I don't want to share all my surprises just yet! I hope I have piqued your interest and that you'll look for a participating Circa 1880 Quilt shop in your area or that you can join by mail. I have other news to share with you soon that I'm very jazzed about! No news, however, on the whereabouts of my stolen quilts. From what I'm told, they are likely in a Houston garbage dump. Very sad. If that's the worst thing that happens, I have much to be thankful for as they can be replaced. We have to keep our perspective as there is so much true tragedy with the California fires and people loosing everything. A few quilts are meaningless in the grand scheme. Much To Be Grateful For! I'm back home from fall market with a whole lot to share. Some really great news and some not so great news. 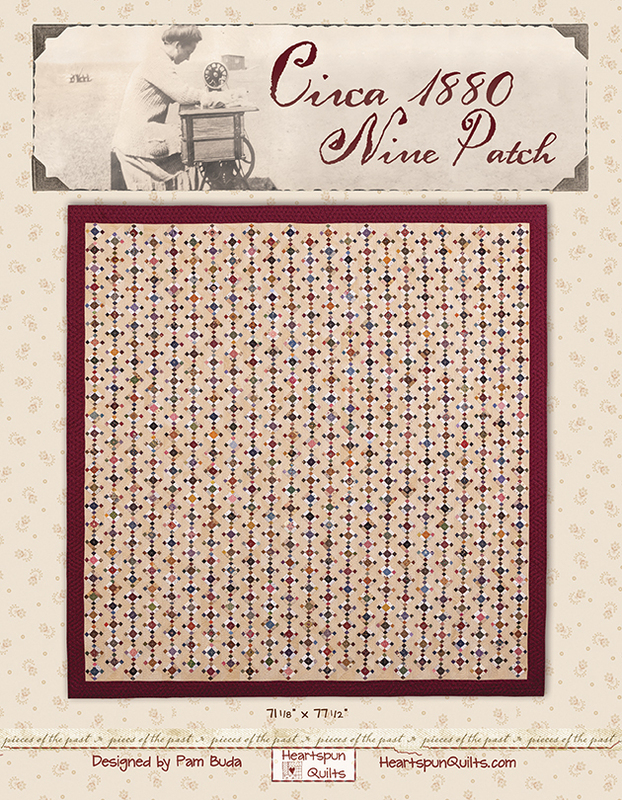 First of all, my year long super-secret-scrappy-project, now known to the world as The Circa 1880 Nine Patch quilt and club was a big hit!! Dare I say the quilt was a show stopper. Many people really did stop dead in their tracks while passing my booth to take a look at the quilt. 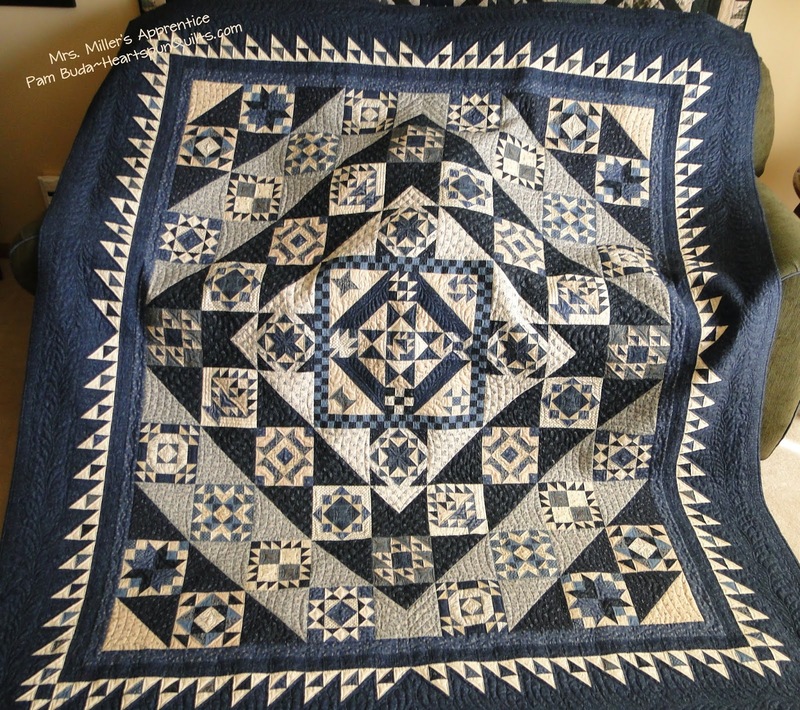 The quilt really is something special and I am so grateful that it was well received by so many people. Lots and lots of shops signed up for this club so watch for your LQS to advertise The Circa 1880 Club coming soon! I still have to show you the small quilts that are a part of the club, too, and will do so in my next post. 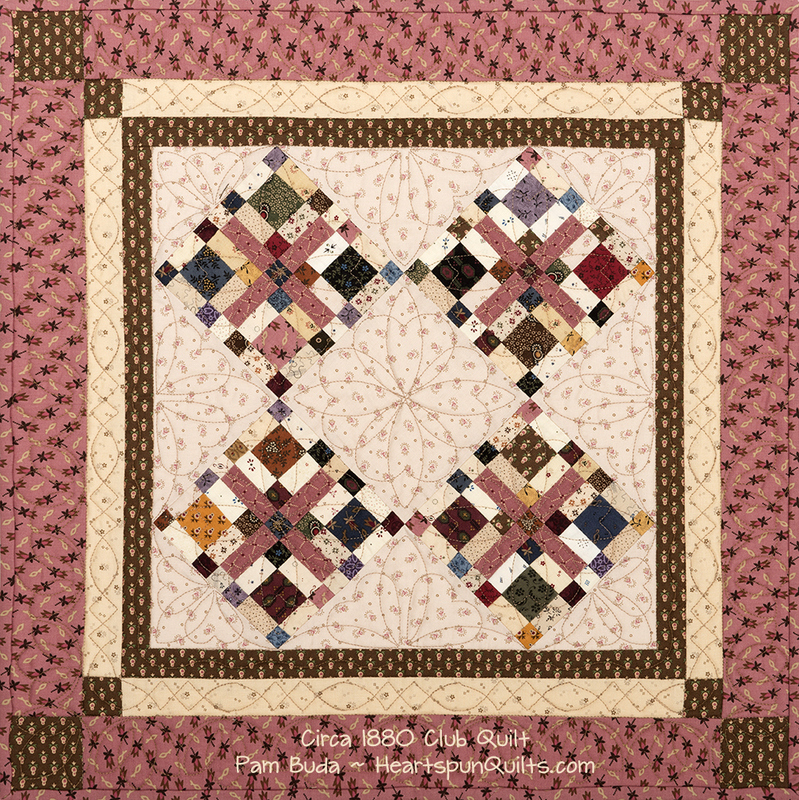 But, I am anxious to get the word out about about the three quilts pictured in the pattern cover above. 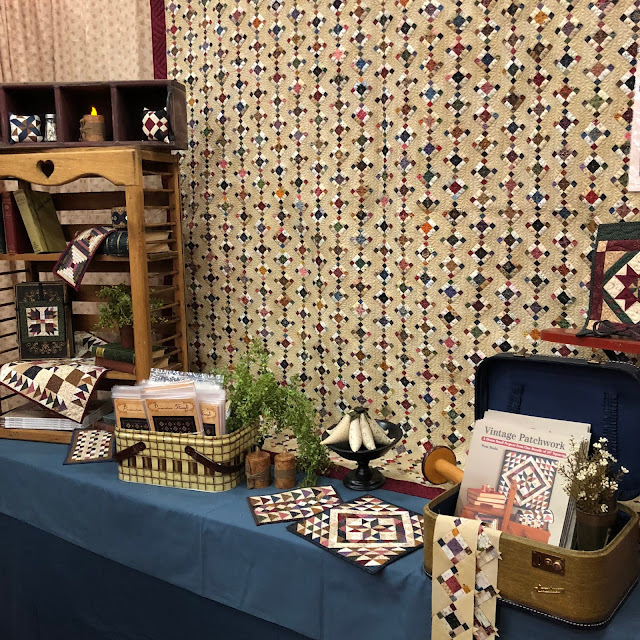 All three of these quilts and the blue one below were stolen from my booth on Friday while we were all attending a Schoolhouse presentation. 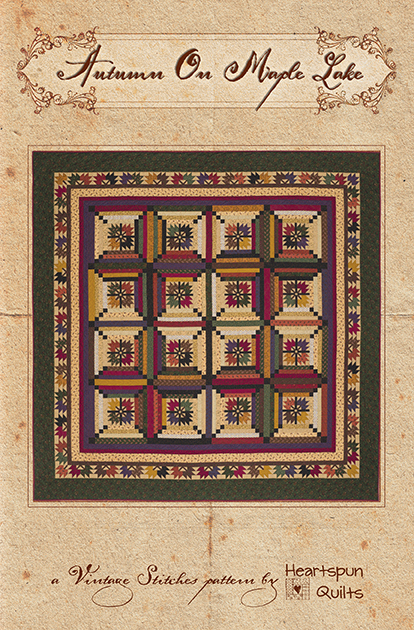 My three Tokens of the Past: Yuletide Greetings quilts, the bonus quilt from Mrs. Miller's Apprentice BOM and four fat quarter bundles were gone when we returned from Schoolhouse. The authorities were alerted. The quilts have labels sewn into them, but I don't have high hopes of them being returned. The head of security said it was likely a convention building worker and not another exhibitor. Market had its challenges this year. My flight was delayed 5 hours going to Houston due to rain, my luggage and all my clothes were soaking wet, I fell off the ladder on Thursday and hurt my back, and my quilts were stolen on Friday. I could dwell on the unfortunate events that took place, but instead I am grateful. Grateful I arrived in Houston on Tuesday safe and sound, grateful my clothes dried and the hotel was able to laundered some others, grateful I didn't hit my head, break a bone or knock my teeth out when I fell. I am grateful to my fellow Marcus designer friends and all my friends at Marcus Fabrics who helped me with everything I needed, and let me know how much they cared! I am also grateful that my new designs were so well received by shop owners and that I safely returned home to my family. It feels much better to be grateful than to hold onto anger about anything that happened. I do ask that should you see any of my quilts on eBay that you just let me know. I am grateful for that as well. I'll be posting about my stolen quilts on social media, and if you have time, please share the post so the word gets around. I am grateful for each and every one of you as well. Thank you for your continued support which allows me to keep doing the things we all love. I am anxious to share more details about my new Circa 1880 Club. The Nine Patch quilt above is the main focus of the club. It has over 500 blocks! Making the 500 + blocks needed for the quilt is very doable in one year's time. (Nobody said you have to make it in a year. I promise there are no Nine Patch police around!) I have worked out all the kinks and have making these blocks down to a science - I promise! All my hints and tips will be shared when you're at club meetings at your local participating quilt shop and through a private Facebook group. Still thinking it's not possible? If you're a regular reader of my blog, you know I keep myself pretty busy. I was on a mission to make this quilt and I had to find time if I was going to get it done. So, I made a commitment to spend one hour each morning, 5 days a week to making the blocks. Sometimes I did less. Sometimes I was able to spend an entire Sunday. It all worked out. At first, I wasted a lot of time and knew I had to work smarter, not harder, and over a few weeks, developed a system that enabled me to make a dozen blocks in about an hour.....and YOU can too!! This quilt is an heirloom for sure....I call it my Hour A Day Heirloom. It's done...I really made it. It's not a UFO! All from one hour a day! To gain a larger variety of scrap happiness in my blocks, I asked six friends to trade blocks with me. We all agreed to a set of trading rules and stuck to them. We didn't make strict timelines to trade because we're all busy, so we traded whenever we had about 25 blocks made. That helped to be able to work at your own pace. A big reason my Circa 1880 Nine Patch quilt is so wonderful is because of them. So, it's time you know who they are! My local (in Illinois) friends are Debbie McClarence, who is my co-worker and right hand. Karen Schultz of Elgin - a dear friend and founding Prairie Women's Sewing Circle member who I have known for many years and adore. Becky Carpenter of Montgomery - another dear friend and founding Prairie Women's Sewing Circle member - friend to Karen as well...and super talented quilter and antique lover like me! Janet Olsen of Logan, UT ~ super talented quilt maker and maker of extraordinary pies! 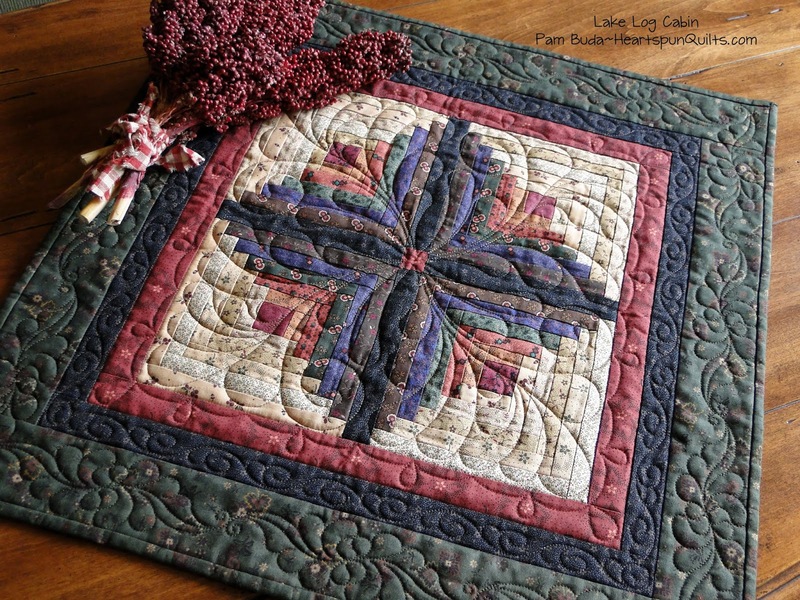 Janet writes a wonderful blog called Rogue Quilter. She inspired me with her beautiful work and makes a lot of small quilts I love. Wendy Reed of Bath, ME - I met Wendy several years ago when I taught at the Maine Quilt Show. I knew immediately we were kindred spirits. 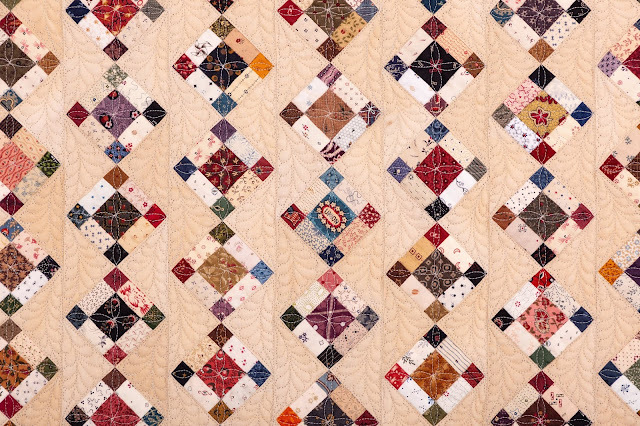 Wendy knows so much about nineteenth century fabric and makes the most amazing repro quilts. 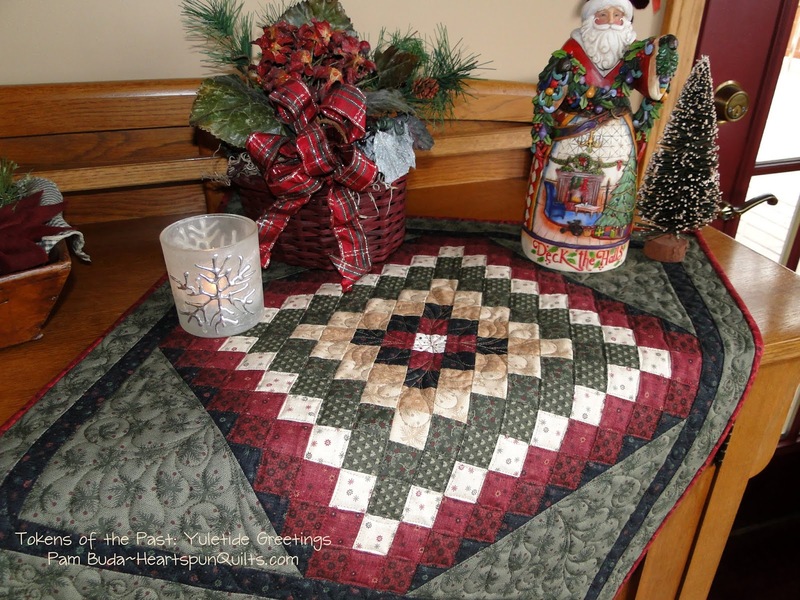 She also has a blog...The Constant Quilter which you should check out. 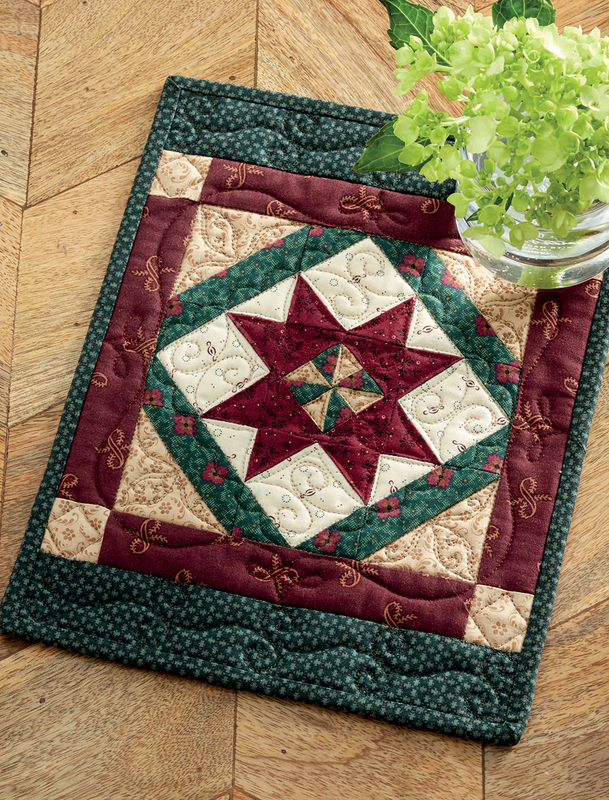 Wendy is hosting a monthly sew-along to sew all twelve projects in my Vintage Patchwork book! How fun is that? Click the link for her blog to read more. 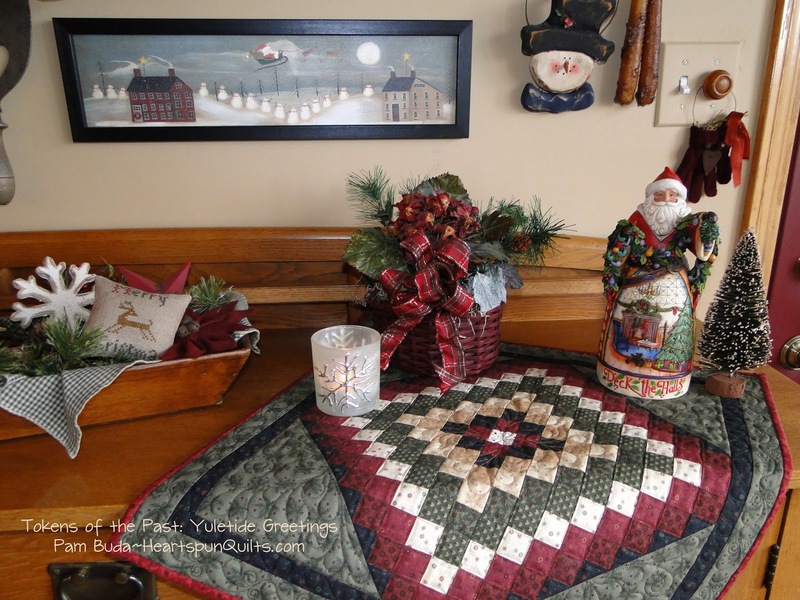 And....last but certainly not least is Cyndi Black, owner of The Busy Thimble quilt shop in Litchfield, ME. I met Cyndi at the same time I met Wendy. I was very lucky to visit The Busy Thimble shop on that trip and immediately fell in love with the shop and Cyndi. Like Wendy, Cyndi makes amazing repro quilts. She also writes The Busy Thimble blog which I'm sure you'll enjoy. One of the best parts about making these blocks is fussy cutting motifs for different parts of the block. In the photo above, you can find the word Union in the block center and the same block has a little flag in the corner square. My quilt has lots of fussy cut surprises. Many of them came from blocks I traded with my friends. Each month I was amazed at how many fabrics I received that I never saw before. Their stash has so many new-to-me fabrics and now I have a piece of them in my quilt. So, so cool!! I L*O*V*E fussy cutting fabrics for lots of the quilts I make. So much so, I have designed a new set of fussy cutting templates that make it so easy peasy to cut just about any size motif you like. The new templates are also making their debut at market and I will be anxious to share them with you when I get back. So...stay tuned for more fussy cutting news! The quilt is set using Marcus Fabrics Aged Muslin which was absolutely perfect in recreating the look of the antique quilt. It is a very special fabric - not your ordinary muslin in that each and every yard is hand dyed. No two yards are the same which gives it the perfect aged patina. 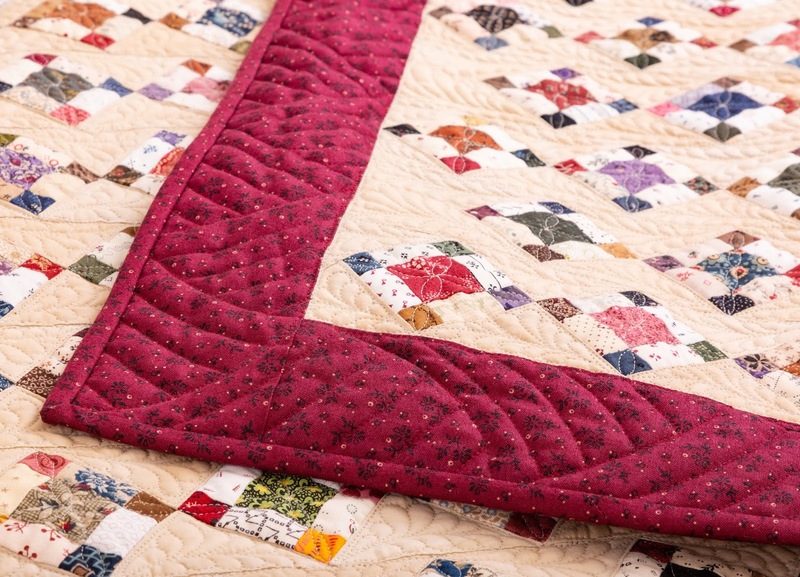 It also shows the quilting stitches beautifully. Speaking of the beautiful quilting....my quilt was quilted by oh-so-talented Valerie Langue who owns The Quilt Merchant in Winfield, IL. Val...you truly outdid yourself!! I also designed 26 new fabrics for the club and a new backing fabric designed especially for the Circa 1880 Nine Patch quilt! I'll tell you lots more about them soon. In the meantime, I'd better get back to packing for fall market. I have a lot to share while I'm there. In the meantime, give your sewing machine some love today! It misses you! My Super Secret Scrappy Project Is Done! For more than a year now, I have been talking about my super secret scrappy project, and boy oh boy am I happy I can finally share what it is! During the summer of 2017, I saw an antique quilt that just captured my heart and I knew immediately I HAD TO MAKE IT! At first I set out to make it by myself, but very quickly I changed my mind and enlisted the help of six friends. The little blocks in the photo above are the results of months of work. I didn't make them all by myself and I will tell you lots more about that very soon. Oh my gosh...they have been so darn fun to make!!! Loved fussy cutting some prints for the block centers and the little corners. Every color under the sun is in these cuties. The quilt of my dreams.....aka my obsession is now a reality. 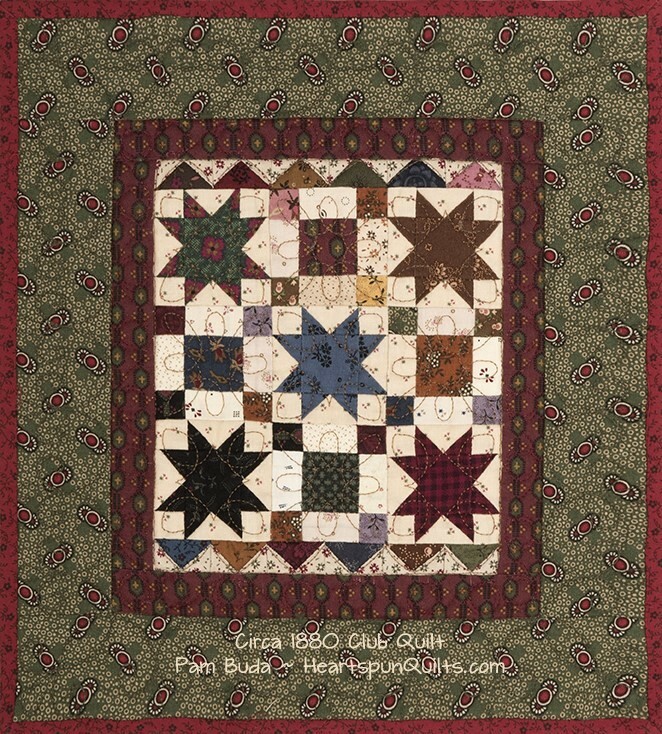 Debuting at fall quilt market, it's a new national club by me....Heartspun Quilts and Marcus Fabrics! 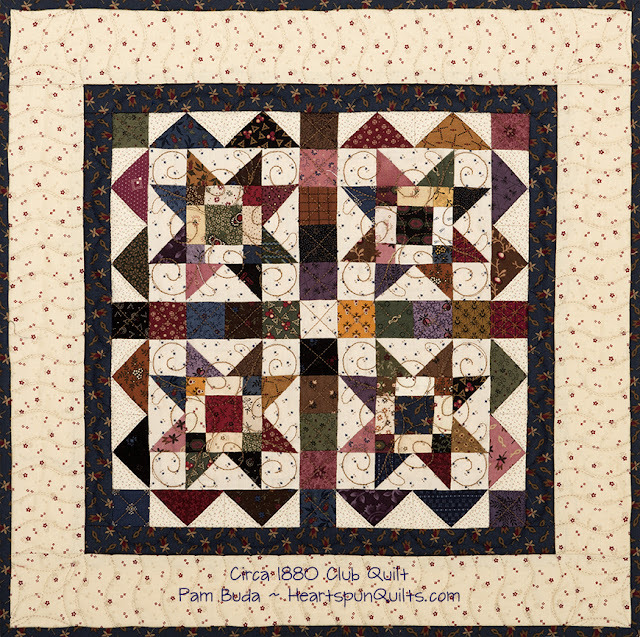 Featuring The Circa 1880 Nine Patch quilt (above) along with fun club projects and activities! 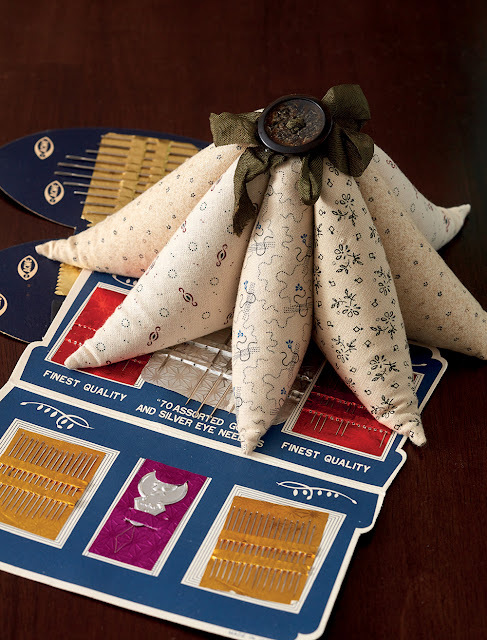 The fun begins in January at your local quilt shop and will be available only through participating shops! More details in my next post. I hope I piqued your curiosity! All the ghouls will be walking about as Halloween will soon be here! I designed this sweet little treat, called Hollow's Eve, that may come to you FREE with a qualifying order!! 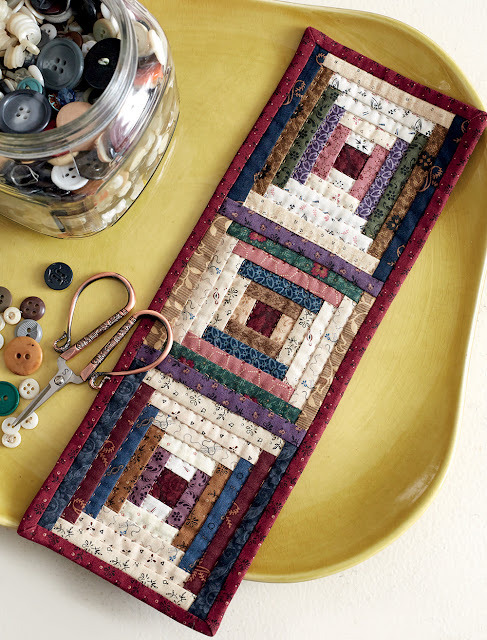 **Place an on-line order for at least $15 to get the pattern FREE. **Place an on-line order for at least $35 or more and receive the pattern AND the fabric kit FREE!!! ~ Qualifying orders placed Friday, October 5th through Sunday, October 7th are eligible. ~ Your freebie will be added to your order when we package it up. The Hollow's Eve quilt is not found on my website, so don't worry about having to place it in the shopping cart. ~Similar fabrics may be substituted. There's lots of stuff on my website to tempt and inspire you! My new Vintage Patchwork book is available! Primitive Threads kits and yardage along with lots of my fabric prints with Marcus Fabrics are available as well. 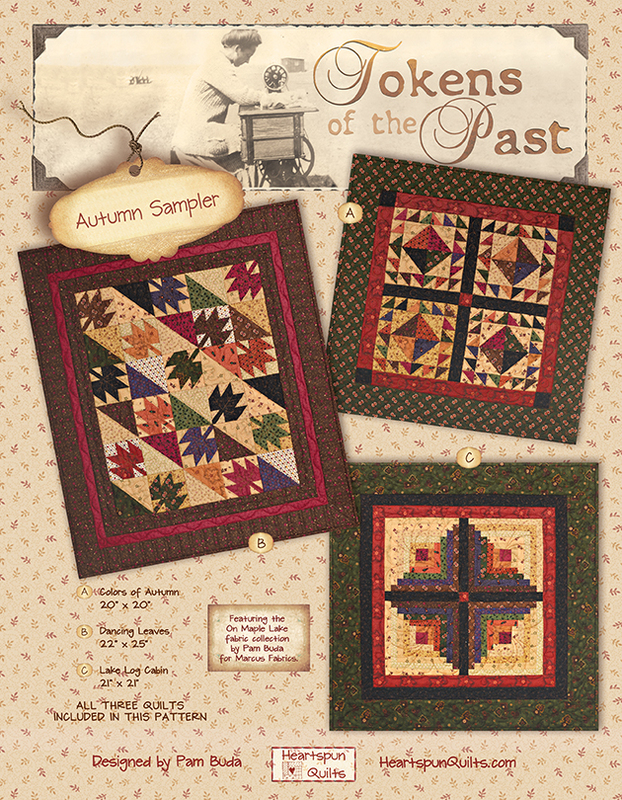 Or, perhaps the Tokens of the Past: Autumn Sampler trio is perfect for your home! 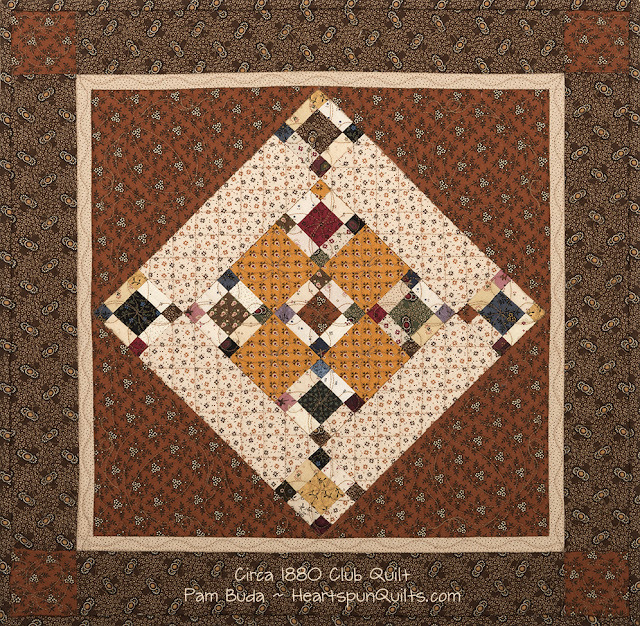 I still have a few Autumn Sampler kits - all with original fabrics. Click here to shop Heartspun Quilts! I invite you to visit Martingale's blog, Stitch This!, today as we talk about the release of my Vintage Patchwork book. 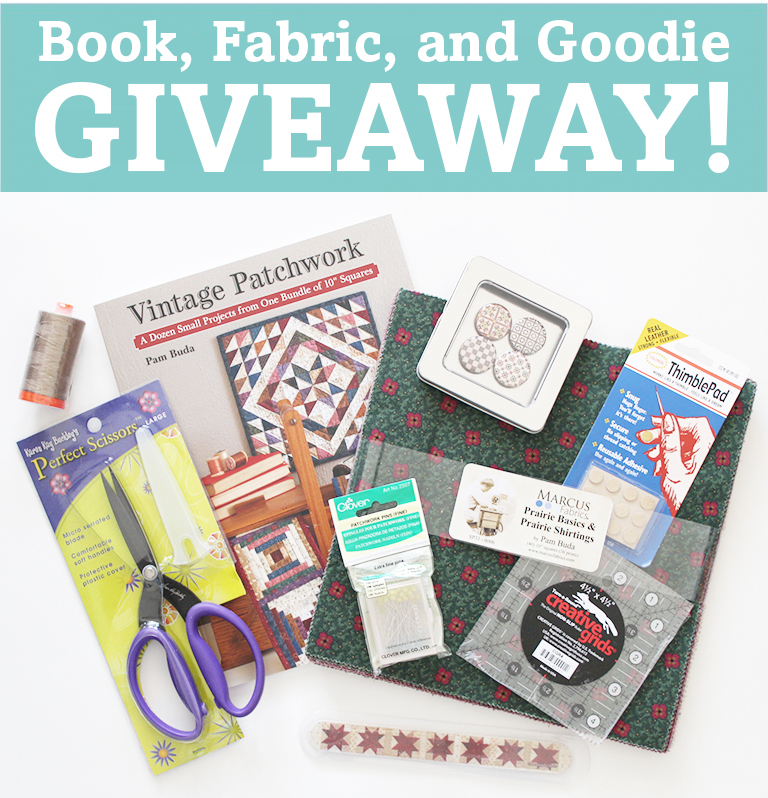 And...you can enter for a chance to win a copy of Vintage Patchwork, the Prairie Basics & Shirtings precut, and a bunch of my favorite quilting goodies!! Is it just me or did the month of September whiz by light greased lightening? Frankly, the whole year has felt like that. 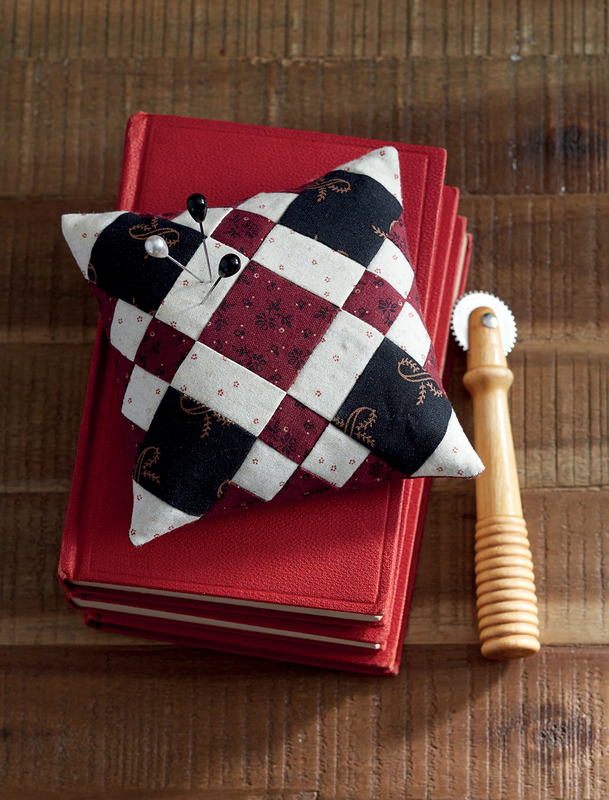 October 1st is Monday (unbelievable) and that means that my Vintage Patchwork book will be released! You still have time to pre-order your copy here and receive the special pieced treat kit I will include on all pre-orders. My thanks to everyone who commented to win a copy of Quiltfolk magazine! I really loved seeing the place that you call home. 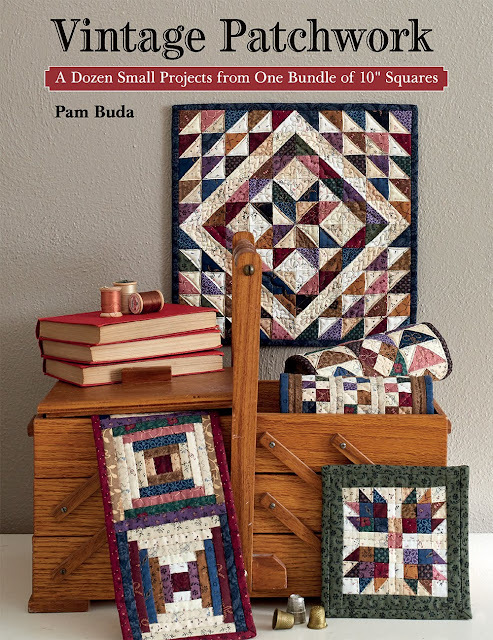 I hope you enjoy the quilts on the pages of this very fine book. Be sure to check visit my blog Friday, October 5th for a special announcement!! Now...back to sewing my super-secret-scrappy-project. It's being assembled now and the big reveal won't be too much longer! Happy Stitching ~ Happy Life! 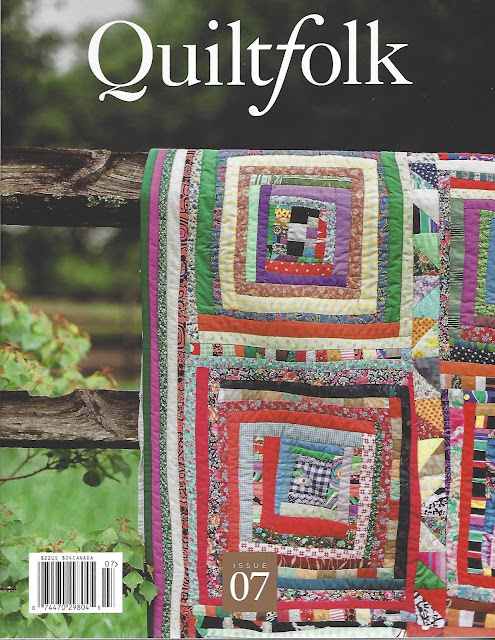 Lately, I've been enjoying sitting a spell and reading Quiltfolk magazine. The magazine doesn't have quilt patterns, but tells stories about quilt folk like you and me, and has loads of quilt photos that are quite inspiring. It occurred to me that I haven't hosted a give-away on my blog in too long.....so, I picked up an extra copy to give away to one of you!! Leave a comment on my blog telling me where you live. That's all....just city, state and if out of the US, the country you call home. I'll choose a winner Saturday morning. I'm back home from a wonderful trip to Nashville. I just loved Nashville!!! What a fun town. The weather was very hot and humid, much the same as it was at home in Chicago....so you go with the flow. The food was yummy, the town was fun and the people are so friendly. That's southern hospitality for you! I will definitely go back again someday. My thanks for the ladies of Music City Quilters and Lakeshore Quilters for a lovely time. I so enjoyed meeting everyone! 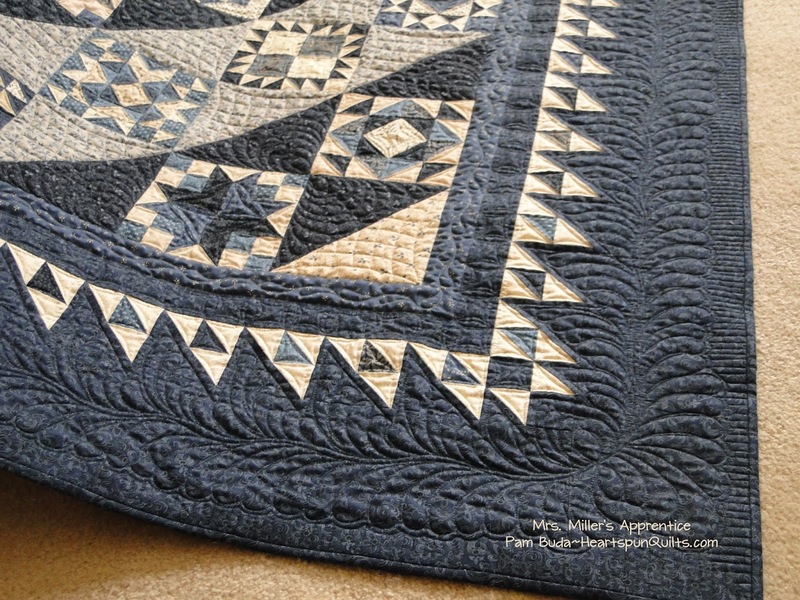 My Mrs. Miller's Apprentice quilt returned home from her trip to Las Vegas where she was quilted by Val Krueger. Val does not disappoint and did Mrs. Miller proud. Before I send her off to be photographed, I thought I'd take some photos of Val's beautiful work. I took these photos in natural daylight inside the house to show off the quilting. This, of course, does not show the true colors of the fabrics. I love crosshatching and Val put a lot of it in the quilt. I'm so happy! This photo shows the fabric colors a but better. I very humbly say that I adore each fabric in this collection! So jazzed with how the quilt turned out and the quilting just put it over the top! Mrs. Miller's Apprentice is my new Block of the Month for 2019. Quilt shops are signing up now to offer the program which begins in January. So....ask for Mrs. Miller's Apprentice at your local quilt shop! Fabrics will ship in December. It is so very important to support our LQS!!! Too many of them are closing. It's terrible. Besides binding Mrs. M., I have been putting the finishing touches on the Mrs. M patterns, and writing the diary stories that will accompany the monthly instructions. It's been fun! I've also begun constructing the quilt that is my super-secret-scrappy-project for the last year! I will finally....(finally!) be able to reveal all sometime next month. There's a whole lot of preparation going on here and at Marcus for the big announcement. I can barely contain myself! I can't believe the summer has whizzed by, although I do welcome the cooler days of autumn. 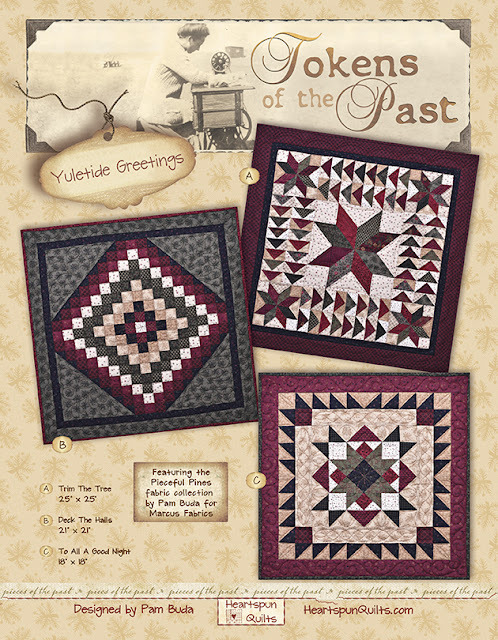 I'm also getting ready for my new Vintage Patchwork book to be delivered next month! Yikes...there's so much fun stuff going on.